I was out of town last week and have been trying to catch up on what didn't get done. It is always a bit of problem getting yarn to the designers for the Fall issue of the magazines. It can take quite a bit of time to get everyone their yarn. Summertime...things really slow down! I've only received a few lessons. I've mentioned before that I send back lessons using the first class rate. This allows me to keep the cost of the course the same. If you want your work back sooner, you can include a prepaid Priority mail envelope. Again, when you send your lesson I would appreciate a heads up with a tracking number so if there is a problem I can let you know. This week's tip was suggested by Binka Schwan who write the "Skill Building" articles for Cast On. The next issue's article is about evenly binding off. Binka let me know that I've never done this topic, binding off in pattern, yes. Since this is something I evaluate in the Basics course it was an excellent suggestion. This topic makes me think of Goldilocks and the Three Bears....Bind offs can be too loose, too tight and just right as the following three photos show. To get an even bind off, make sure that you are working the stitches on the barrel of the yarn, not the tips and to take care how you tension the yarn. If you pull too tight, you will get a strangled bind off that pulls in the top of the piece (picture this type of bind off on a shoulder seam!). If you don't control your tension at all you might wind up with a really loose bind off. I sometimes recommend using larger or smaller needles for the bind off row but it is far better just to work on achieving an even bind off with the project needles. It spares you from having to carry around a full range of needle sizes. While we are on the topic of bind offs....look at the top photos and then at the last photo and compare the size of the last bind off stitch. 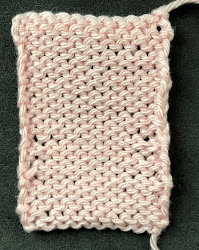 I made no effort on the first swatch and on the last swatch I used a suggestion from Suzanne Bryan. I mentioned this in my last post but here is the link: Last BO Stitch. I wrapped the second stitch the wrong way on the row before the bind off. This works great if you can remember to do it! Salon will be on Sunday (June 3rd) from 2-4pm. Since the topic of the Stitch Anatomy lesson in the Fall 2018 issue will be Bavarian stitch I decided to do a baby sweater. God forbid I do something sensible working it in the round. No, I'd rather do it flat which requires much more concentration. The baby sweater is done. I'm going to have to put tissue paper in the arms for the photo shoot as I made it a bit big. Elff sent the yarn and I did a small swatch to check out the colors. We've done some small adjustments as some of the colors didn't have enough contrast. I can't wait to get started!